Everyone wants to show you their best photos. Many are impressive, some are computer generated and others just leave you wondering. Here is a photo for you to look at. Go ahead and study on it for awhile. 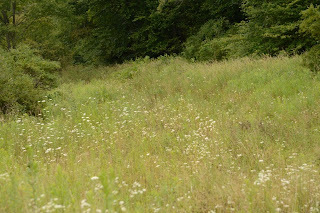 Can't find anything can you? Well that is because it would have been a very good, slightly overexposed photo of a very large bobcat; in broad daylight. Something you don't see very often. Well, you would have seen it here; if I had only been a second faster. Oh. well. The very next day, I was fishing on the North Fork of the South Branch and catching several small to medium sized small-mouths. I was standing and doing a balancing act on many round, smooth rocks. I saw a yellowish blur go by my head. 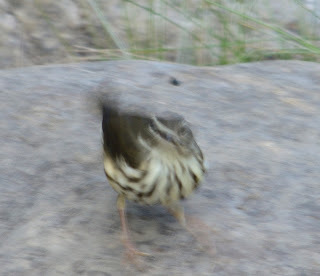 A Louisiana Waterthrush landed about 5 feet behind my and was poking around in the rocks. The main problem was that my camera was in a bag; about 3 feet behind me. I did manage to get the camera; without spooking the bird. The little waterthrush was quite cooperative and began drinking rainwater from a bowl in the rocks. Nice, right? Nope, it was too close to focus on and I was on both knees in the rocks. There wasn't much that I could do. Yep, nobody wants to show you their bad shots. Here is another of mine; the Louisiana Waterthrush as it runs by me and flies across the river. Enjoy honesty. 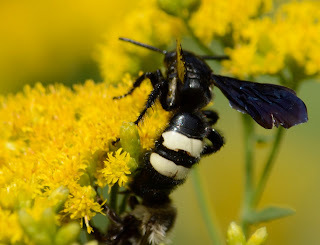 Here is another Digger Wasp that was present on my goldenrod yesterday. There was only one. It is a Double-banded Scoliid (Scolia bicincta). There isn't much information out there for this species; other than it most likely lays its egg in some type of beetle larvae, underground. I was heading to the garden yesterday morning to pick some corn and noticed several very pretty wasps on the goldenrod. I had never noticed this species with the two yellow dots before. I snapped a few photos and went to the computer for identification. 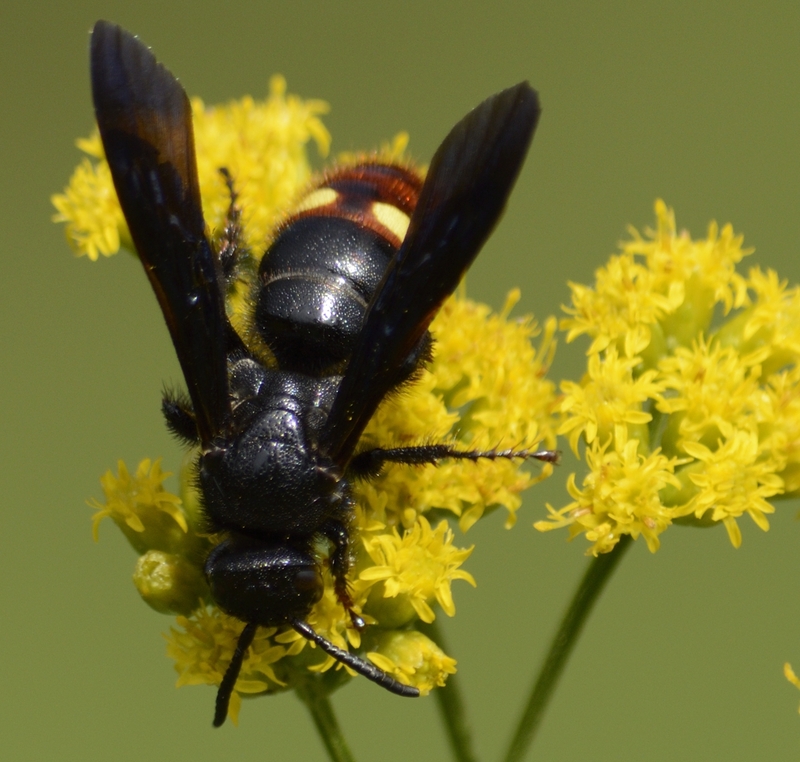 This is the Blue-winged Wasp (Scolia dubia) it is also called a Digger Wasp. The female lays its egg in the larvae of green June Beetles and Japanese Beetles. They build a chamber around the paralyzed larvae and a new wasp emerges from the ground in 3 weeks. They are native to Japan and were introduced to combat Japanese Beetle infestations. These wasps are now common from New England to the South and West to the Rocky Mountain Region.